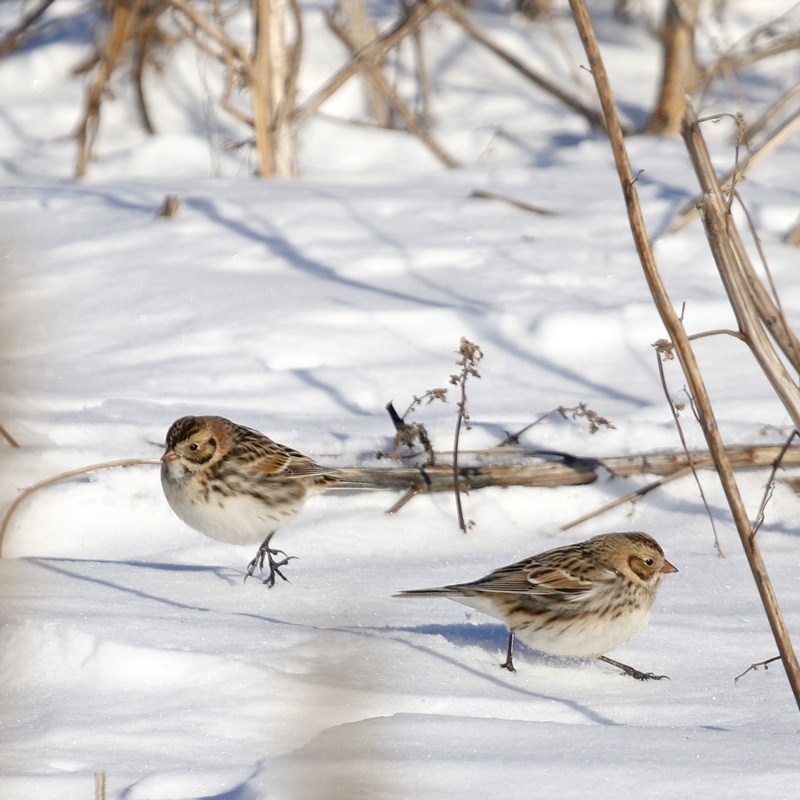 I tried over the past couple of days to get some better shots of the Lapland Longspurs on Missionland Road. Yesterday the light was perfect and the birds were on the road but I had no luck with photos. . This afternoon the light was good, and although the birds did not come in as close as I would like, I did manage to get some better shots. I had 4 LALOs in a small flock of Horned Larks. Also present today was a nice flock of American Goldfinches, many Savannah Sparrows and American Tree Sparrows, and a single Song Sparrow. 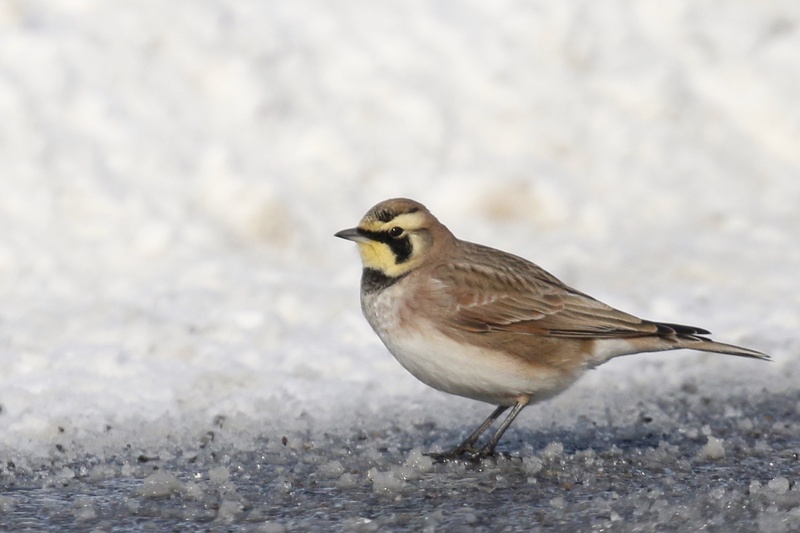 The Horned Lark photos were taken on Tuesday when I first saw the LALOs. ~A Horned Lark leaps to presumably grab and pull down some seeds to eat. 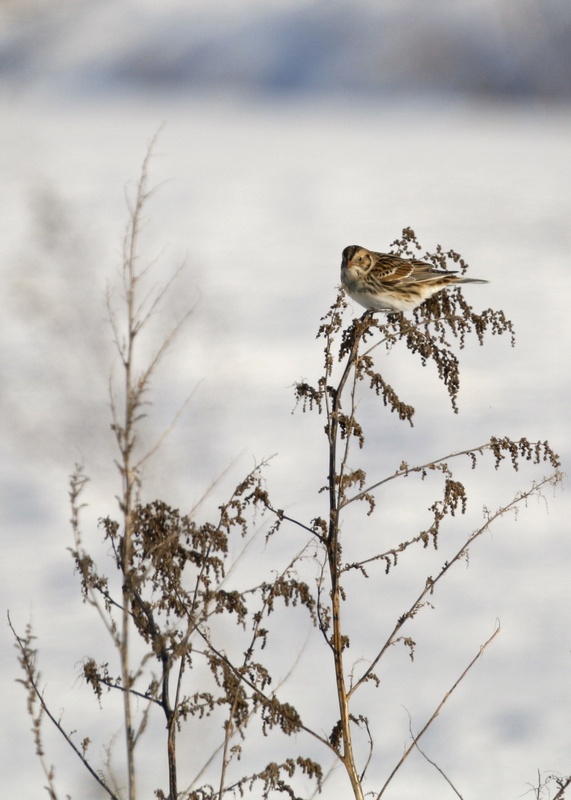 I noticed this week that while the larks use this technique, the Lapland Longspurs will actually perch to feed…. 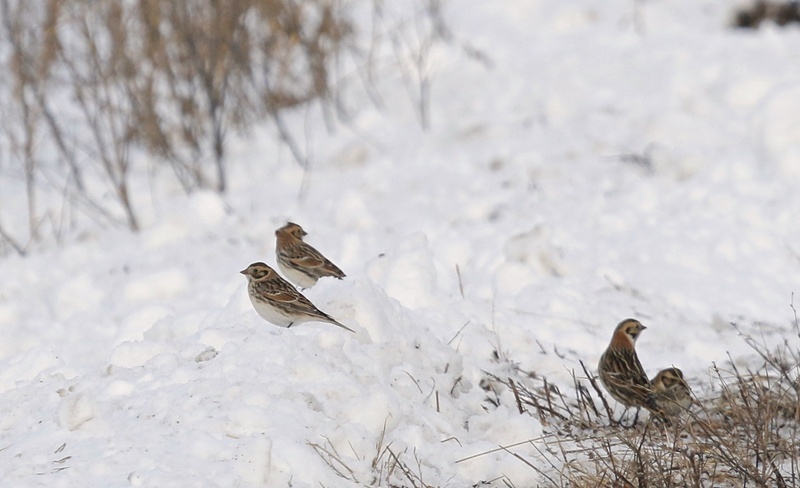 QUICK POST: This afternoon, just after 3:00, I had 6 LAPLAND LONGSPURS on Missionland Road. 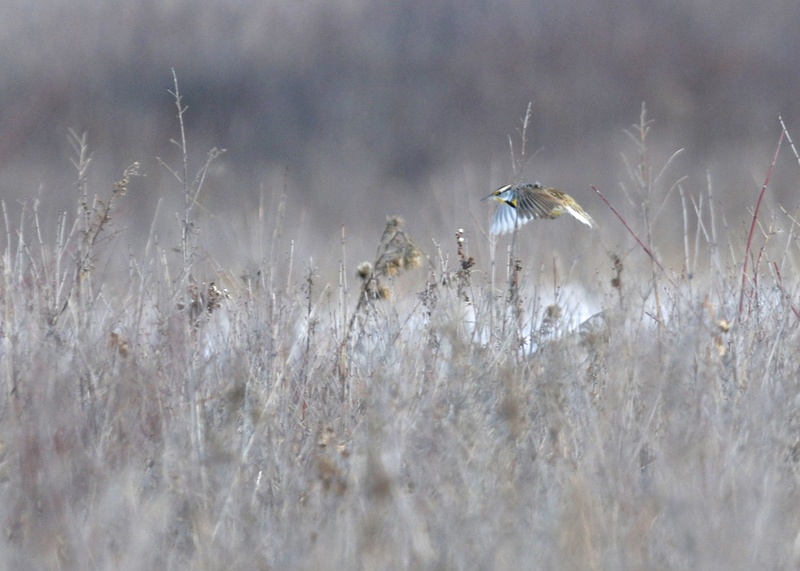 I had just finished looking through hundreds of Horned Larks hoping for longspurs or buntings but without success. I have photos which contain all six birds, but unfortunately none came out very well, so here is a decent shot with four of the six. Nice birds to see, that’s for sure. 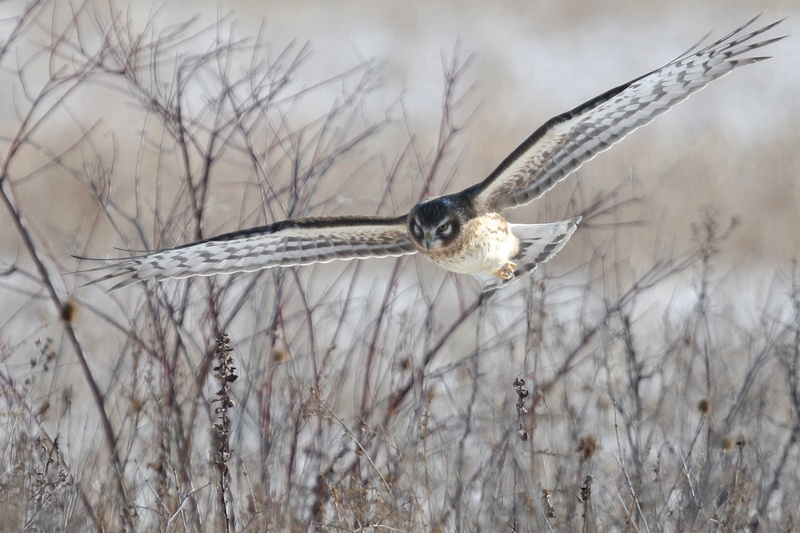 Author mattzeitPosted on January 27, 2015 January 31, 2015 Categories Black Dirt, Orange County, Rarities8 Comments on LAPLAND LONGSPURS! While the Eastern Meadowlarks were the highlight for me this past Sunday morning, I also did relatively well with raptors. Especially since I was out for only two and a half hours. One interesting observation I made was that since it was a windy morning with the wind coming from the west, most of my shots ended up being at least partially backlit. 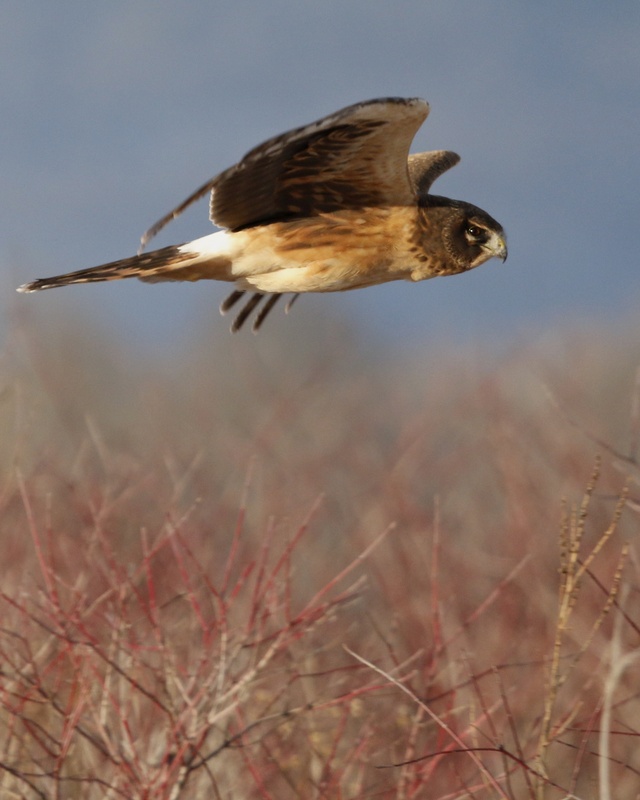 It seems to me that, at least when it comes to Northern Harriers, these birds tend to hunt while flying into the wind. 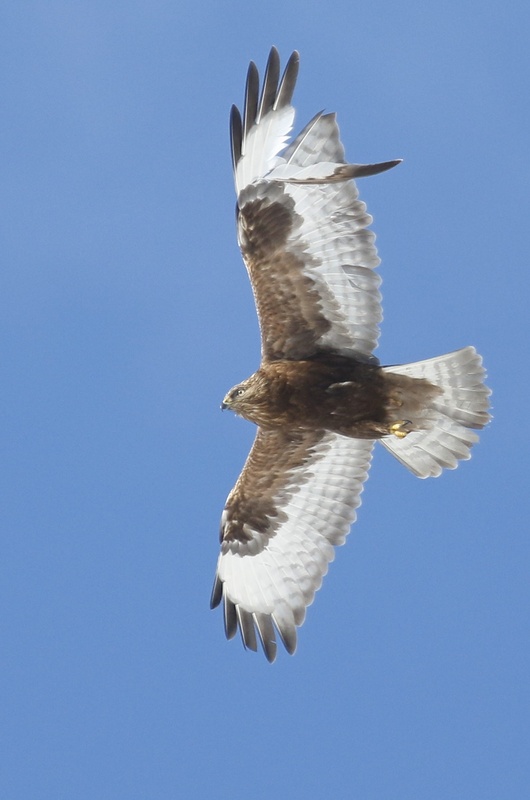 With a west wind, that means most of the time when I had a bird flying towards the blind it had the sun at its back. 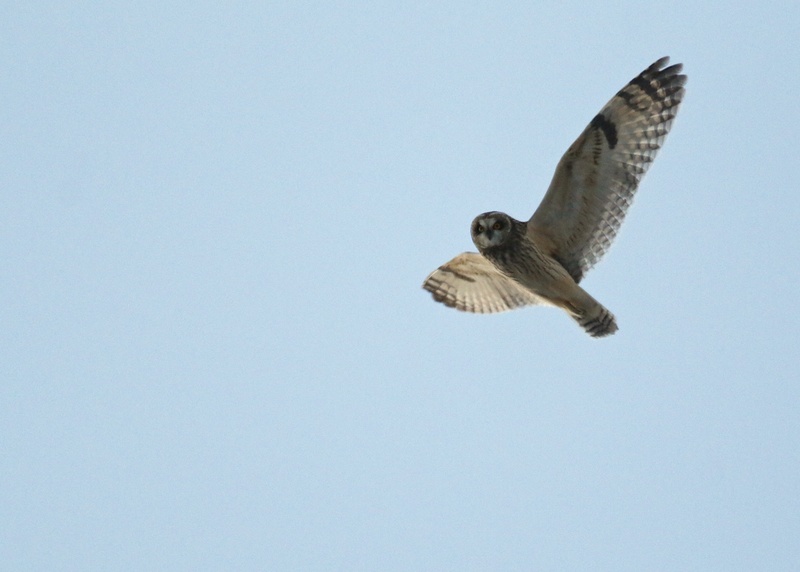 Here is a list of raptors that I had for the morning, and I should mention that when I got back to my car, Ralph let me know that about a dozen Short-eared Owls got up for about twenty minutes – not too far from the parking area. I never saw them since I have my back to the parking area when I’m in the north blind. 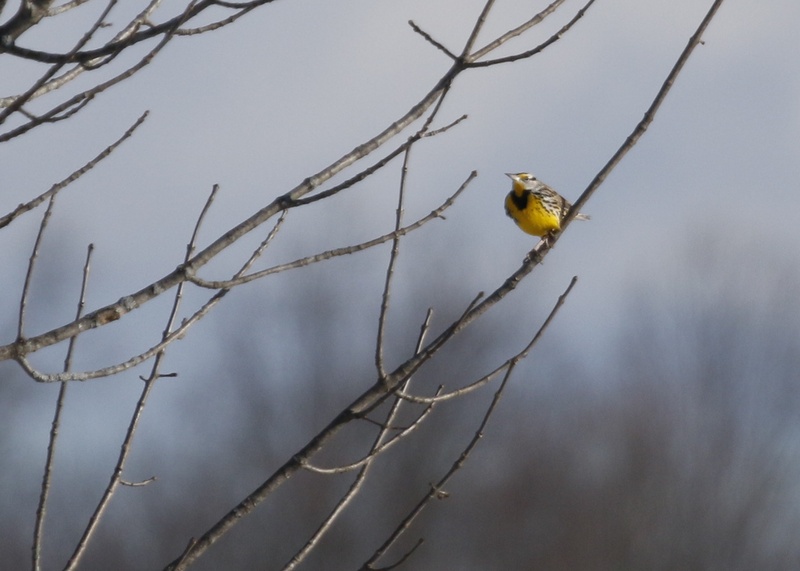 I was pleasantly surprised when three Eastern Meadowlarks landed and perched in the tree in front of the north blind at Shawangunk Grasslands National Wildlife Refuge. 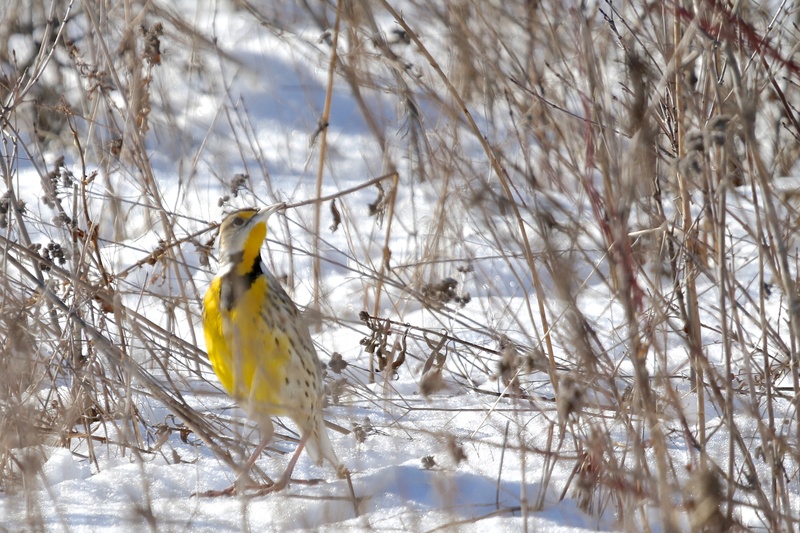 I knew that there were some meadowlarks present at the refuge this winter because I’ve caught fleeting glimpses a couple of times this January. 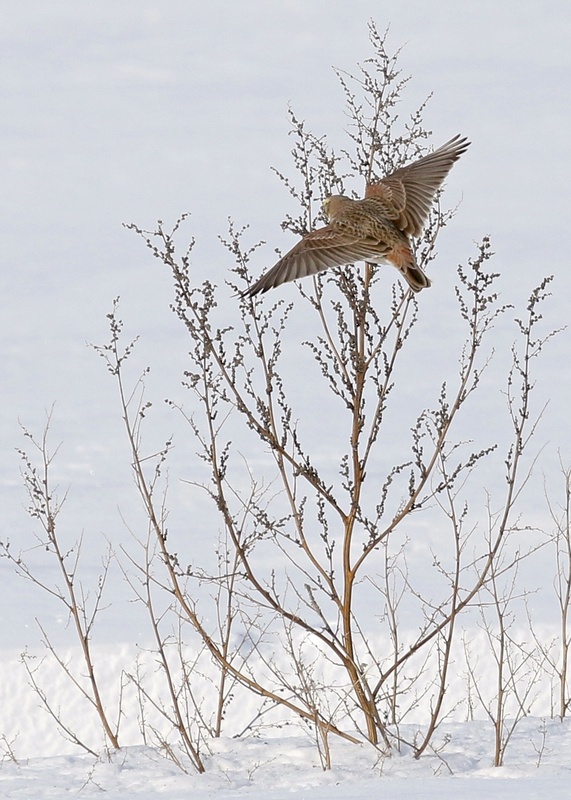 But this was not a quick look, the birds perched in the tree for a little while and then dropped into the grasses in front of the blind to feed. 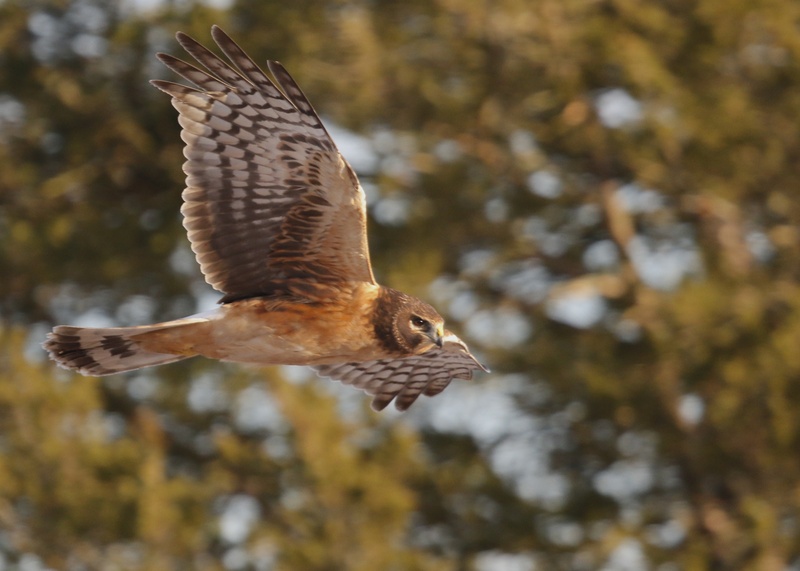 Before any of the meadowlarks gave me a clear shot for a photo, a female Northern Harrier flushed the birds and they relocated to a tree behind the blind. 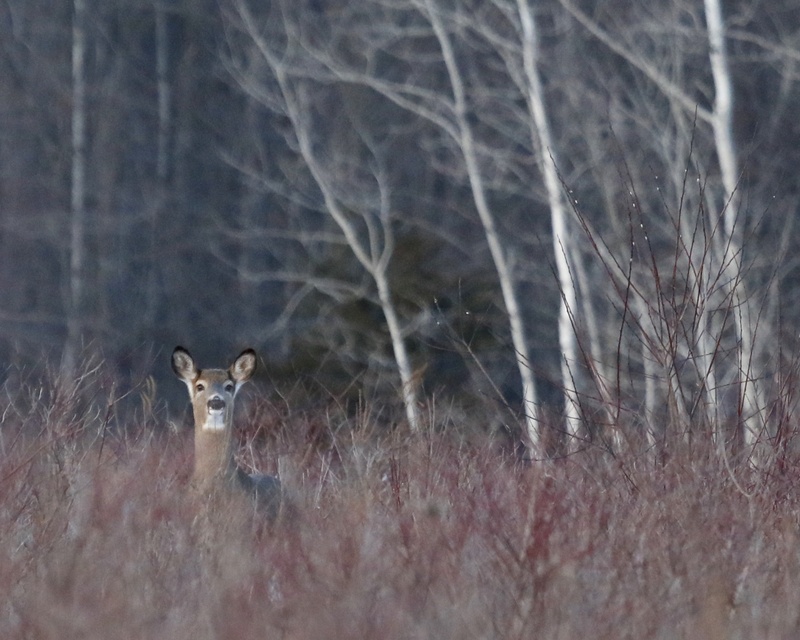 Again, they dropped down from the tree to forage through the grasses behind the blind which were not as thick as they were in front, allowing me to get some photos. 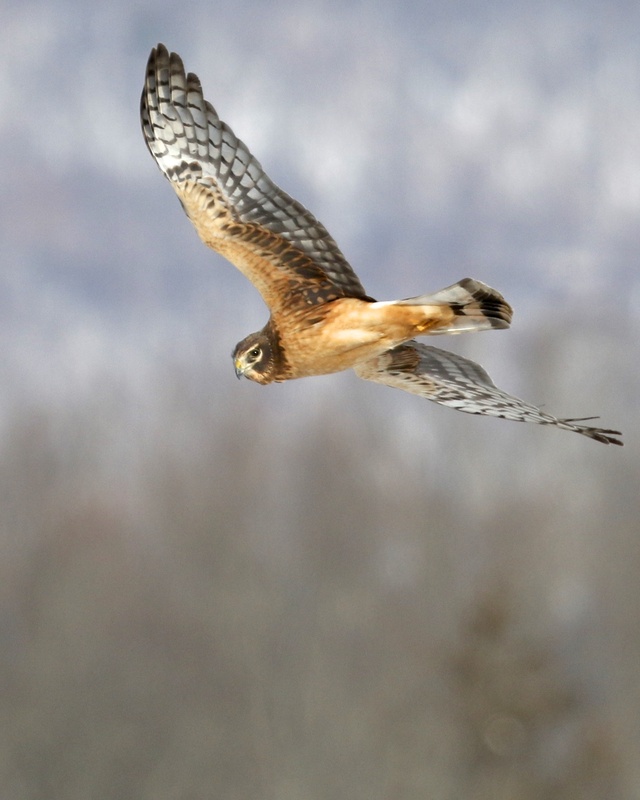 I looked at the range maps in the Crossley Guide, Sibley Field Guide, and on the All About Birds website. 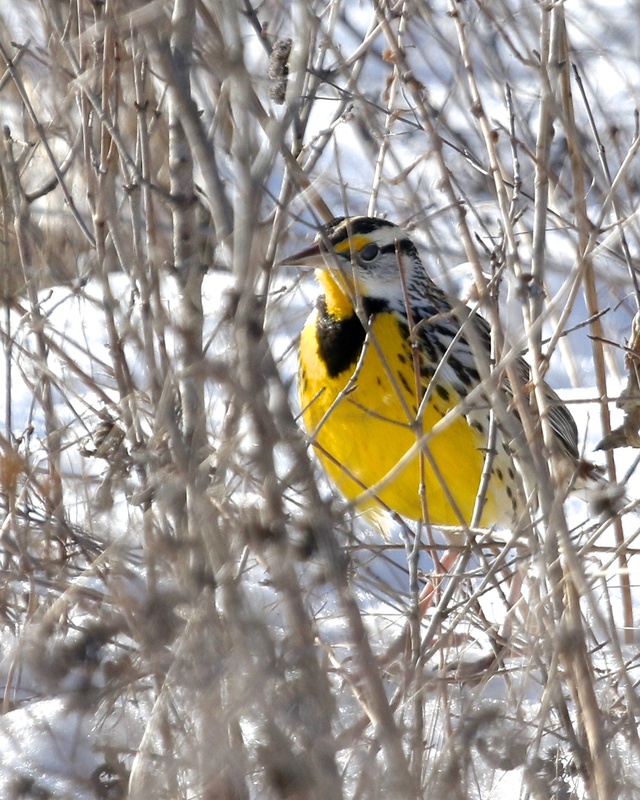 Both the Sibley and All About Birds range maps include Ulster County, New York as part of the year round range for Eastern Meadowlarks, while the Crossley Guide has it just as “typical breeding range” but not very far from the year round range. 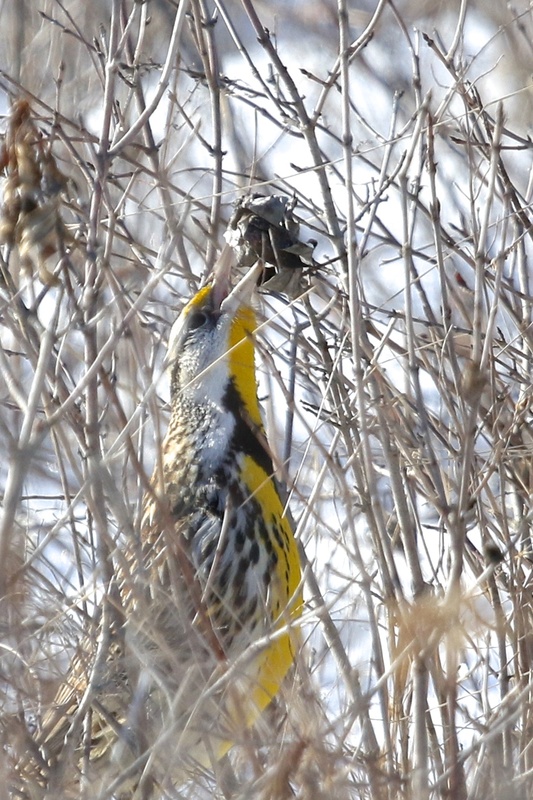 According to the Stokes Guide to Bird Behavior II, Eastern Meadowlarks gather into flocks in the late summer after breeding. 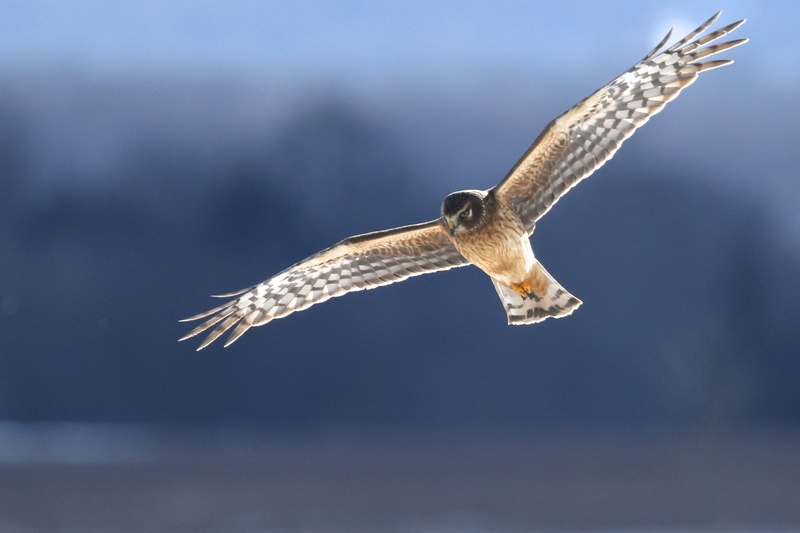 Some flocks move southward while others remain to winter and “forage in old fields of corn, stubble, and weeds. At night they roost together, often in the tall grasses of marshes. Occasionally they join with grackles to roost”. 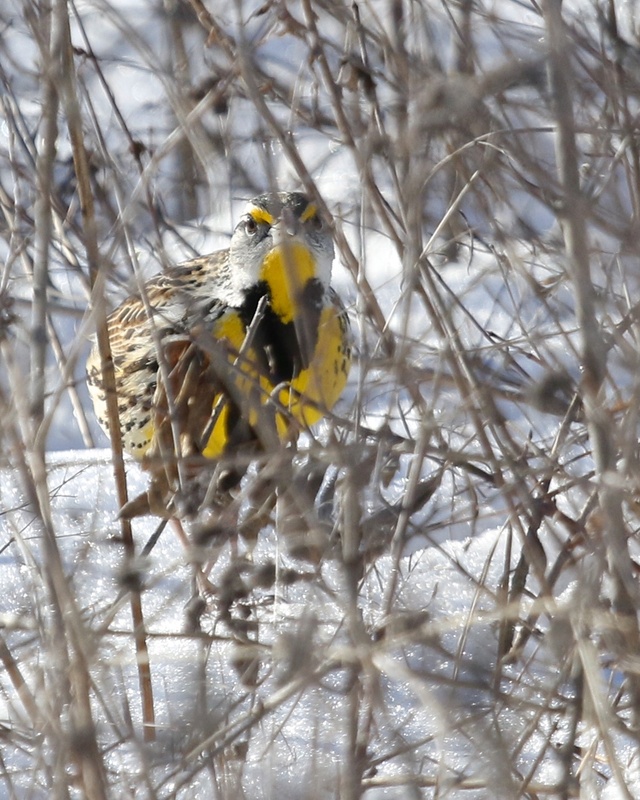 As much as I love to go to the grasslands for the raptors in the winter, the meadowlarks were a wonderful surprise for me this morning. 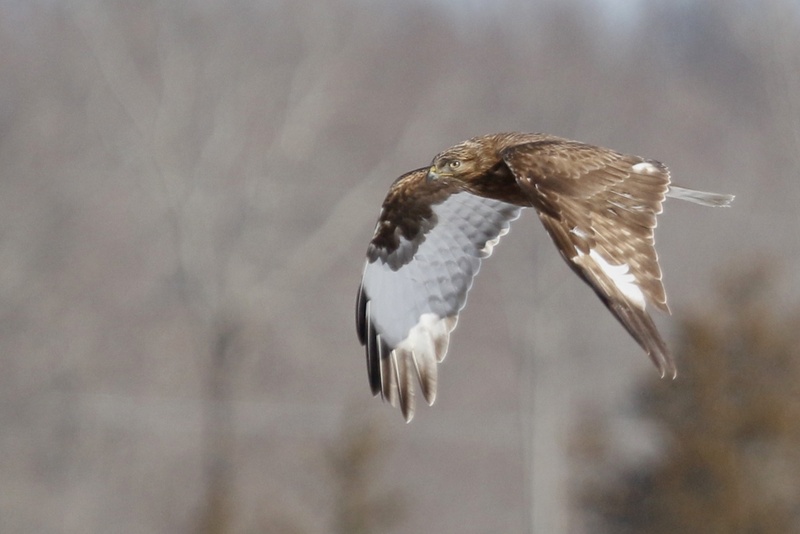 There was plenty of raptor activity as well (Rough-legged Hawks, Red-tailed Hawks, American Kestrel, Northern Harriers, Black Vultures), and I will prepare a post for them in the next day or so. I got out a little late on this Saturday morning because I was waiting for the roads to clear from the fresh snow which had fallen overnight and continued to fall into the morning. I spent a little time in the New Hampton area of the black dirt. From Celery Avenue I could see many Canada Geese over the river in the fields that run along Onion Avenue. I stopped to scan them and from there I could see that there were approximately 20 SNOW GEESE among them. 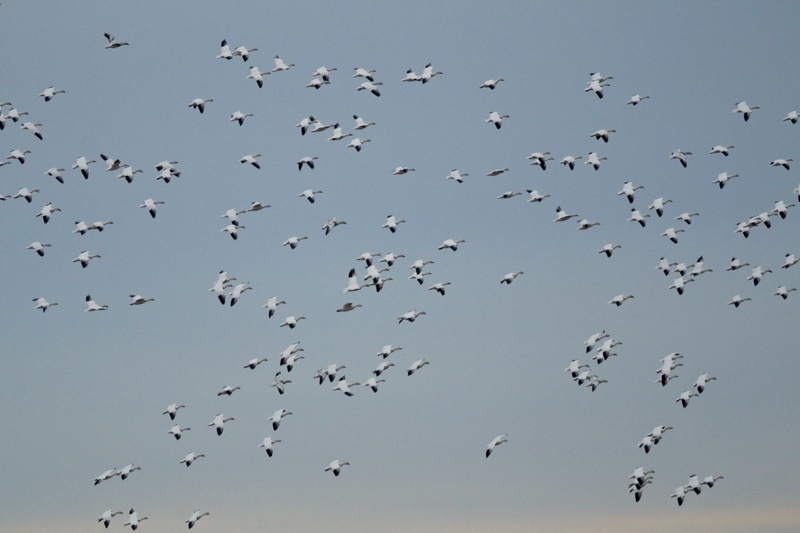 The Snow Geese were difficult to make out – there was plenty on the ground and it was still falling. I hustled around to Onion Avenue and spent some time scanning a large group of geese; I estimate over 1200 Canada Geese and maybe 100 Snow Geese. I did not find any other types of geese in with them. I birded my way up to Turtle Bay Road before turning back (I wanted to get to the Newburgh Waterfront for late afternoon to try for gulls again). 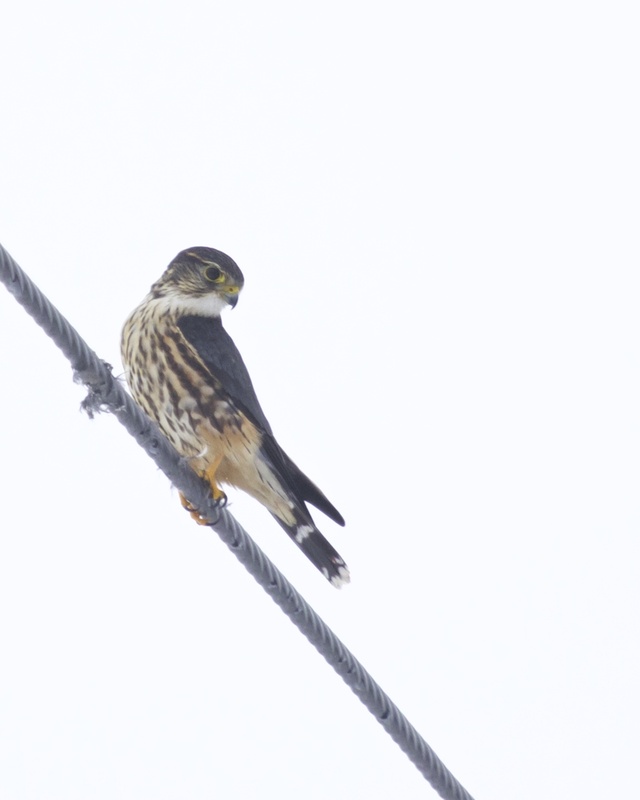 Along the way I came across what is likely the same Merlin I have had before, as it was perched in the same spot on a wire along the road. I saw a couple of distant flocks of Horned Larks and then a small group landed briefly on the road. 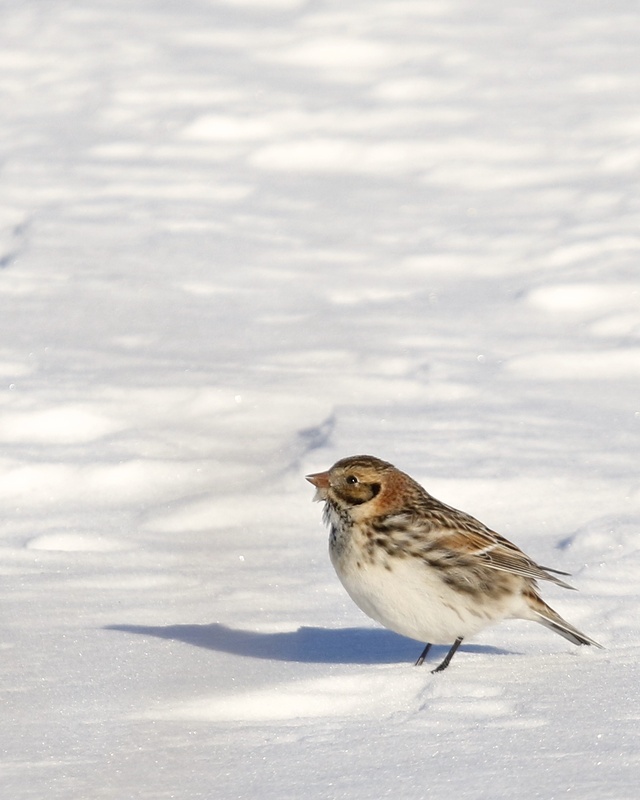 Among them was a single LAPLAND LONGSPUR, which was awesome to see. I tried for gulls from the old Torches parking lot on the Newburgh Waterfront. There were many present, mostly riding the ice floes up the Hudson River. Herring Gulls seemed most numerous, followed by Ring-billed Gulls and then Great Black-backed Gulls (which I had nearly 30 of). I had one distant first winter Iceland Gull, but no sign of the bird I had yesterday and believed was a Lesser Black-backed Gull. I guess a better, confirmed look at that bird will have to wait until another day. When I have seen a bird that I am not very sure of, I really like to have a photo, because as time passes, doubts start to creep into my mind. I had a couple of raptor highlights while I was there as well. Out on the ice I had 8 Bald Eagles. 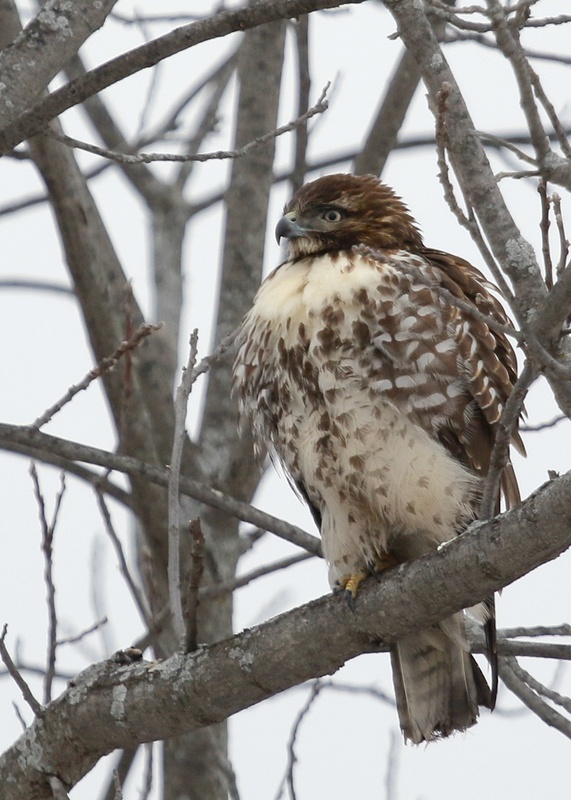 In the parking lot, a woman stopped her car to tell me there was a hawk perched on a post. 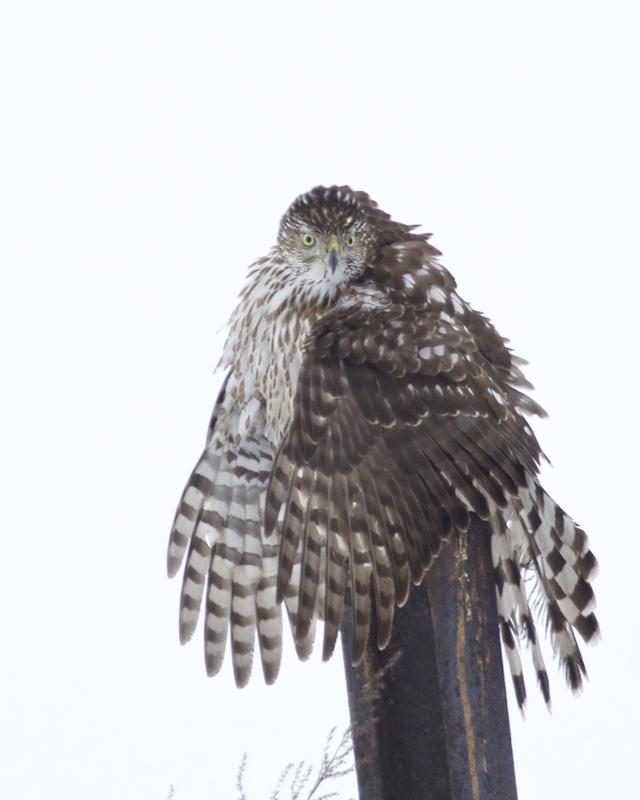 It ended up being a Cooper’s Hawk that posed nicely for me. For a day where I wasn’t sure if I would even get out, it was a really good day. 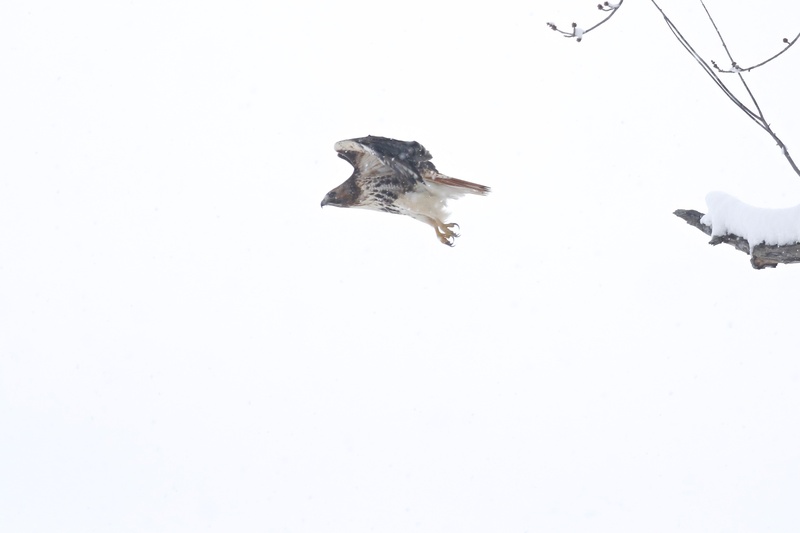 ~A Red-tailed Hawk leaves a snowy perch on a snowy morning in New Hampton, NY 1/24/15. ~Snow Geese in the snow. Onion Avenue, 1/24/15. QUICK POST: I went to the Newburgh Waterfront this evening after work to look for gulls. 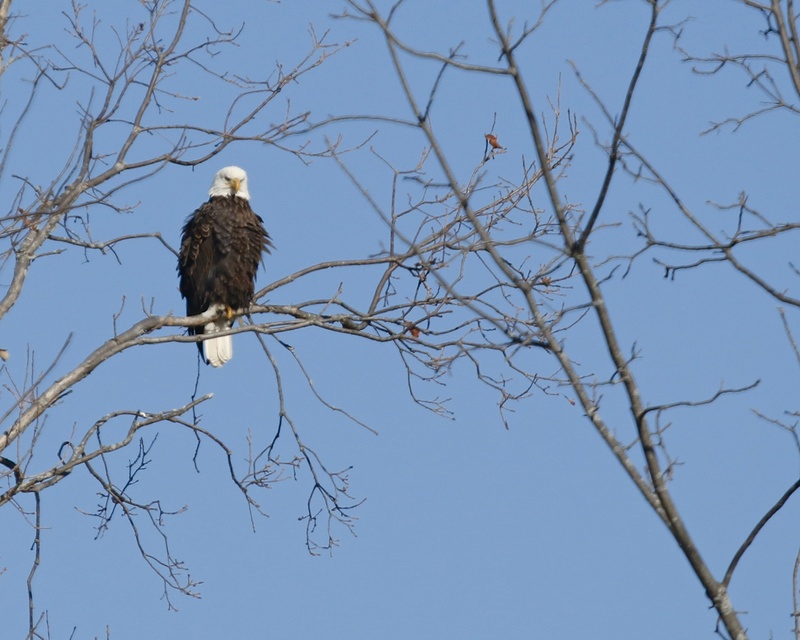 I parked in the old Torches parking lot and just as I got out of the car an adult Bald Eagle flew over. I scanned a large number of gulls floating in the river with my scope because most birds were rather distant. I walked a couple hundred yards south where most of the gulls were located and saw a bird that I believe was a LESSER BLACK-BACKED GULL. Bruce Nott had arrived with his friend Rob, I walked back to get them to have a look at the bird. Meanwhile, they were looking at a first winter Iceland Gull, which I got a good look at through Bruce’s scope. We made our way back to my scope and relocated my bird. We kept walking south to keep up with the floating gulls. 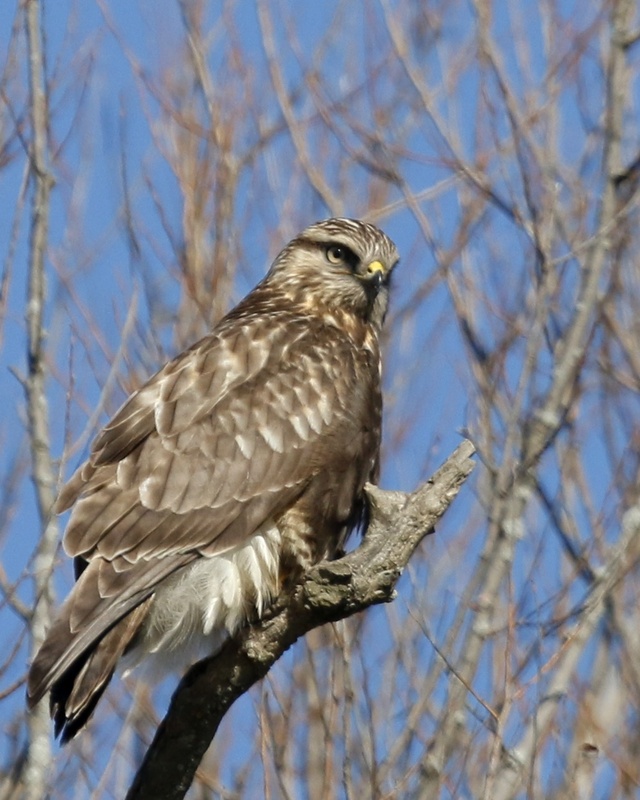 The bird had a slate gray back, gray smudging on the head and was slightly smaller than the Herring Gulls nearby. At one point I had the bird in the same scope view as a Great Black-backed Gull and the size difference was considerable. I am confident that it was a Lesser Black-backed Gull, but I would certainly like to go back for a better look and of course get some photos. Tonight I spent some time at Pierce Circle in New Hampton, NY going through approximately 2,500 Canada Geese. I scanned the geese a bunch of times but was unable to find anything other than Canadas. 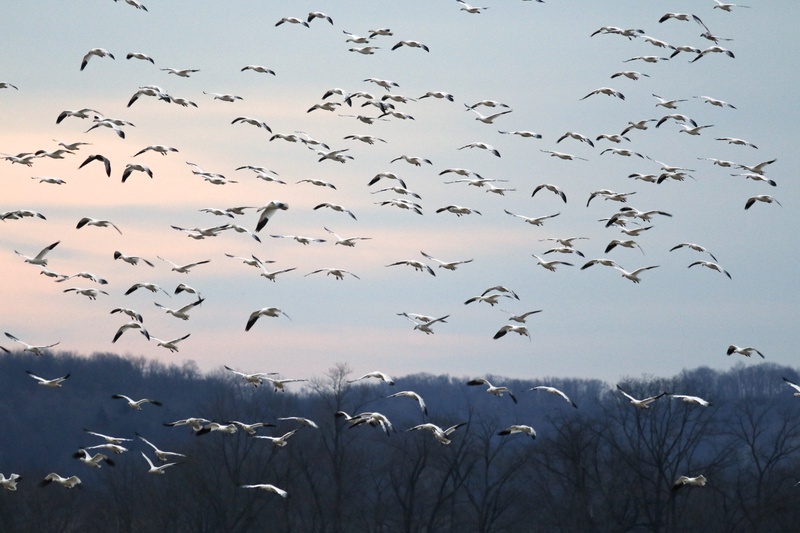 I was just starting to pack it in when I saw another group of geese coming in – it was SNOW GEESE! Approximately 150 birds circled over the fields a couple of times and then settled in among the Canada Geese. It was awesome to see them, and to think I came so close to missing them! 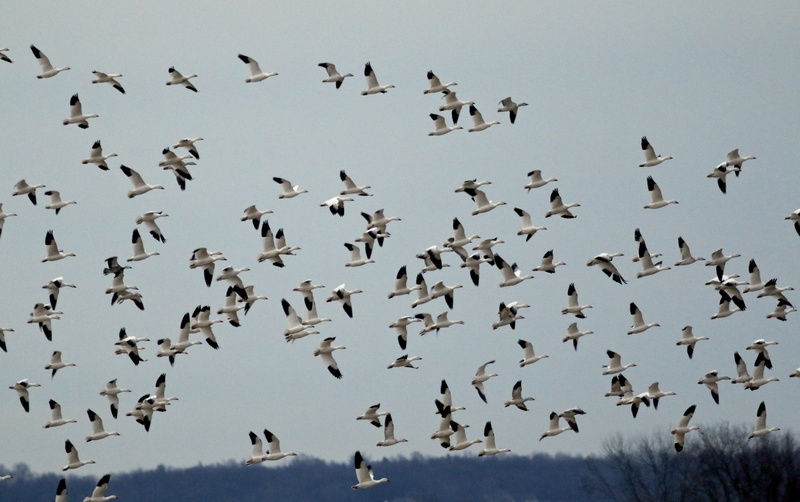 ~Snow Geese in New Hampton, NY 1/20/15. Karen Miller and I attempted to participate in the Mearns Bird Club Waterfowl Count yesterday, but we were thwarted by the weather. We started out alright, covering a small part of the Black Dirt Region and counting nearly 3,000 Canada Geese, over two dozen Mallards, and 6 Common Mergansers. Then the rain began in earnest, and the roads quickly became very icy and downright treacherous. At the first sign of icy conditions, we called it and headed home, and I’m glad we did. We both made it home safely, thank goodness. 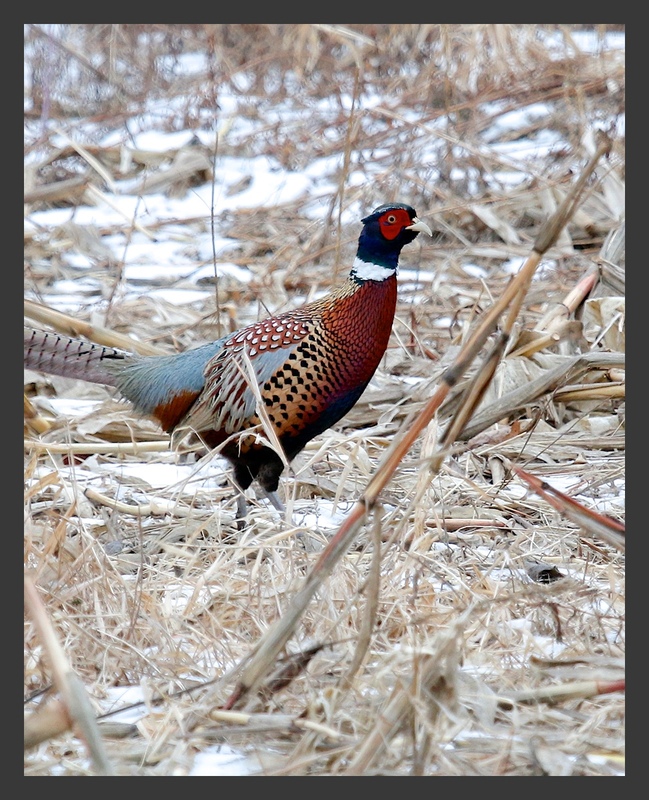 The highlight of the day was seeing a male Ring-necked Pheasant on Pierce Circle and getting some photos. 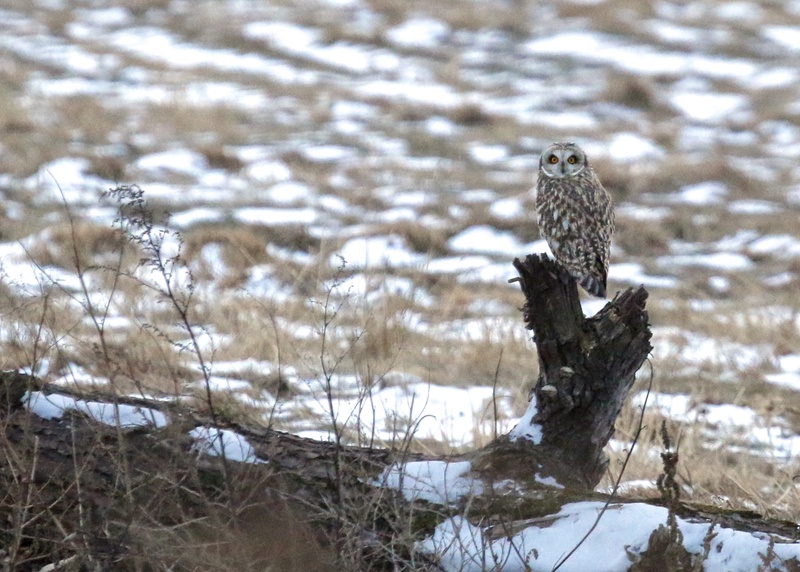 The big news this week was the eBird report of a Snowy Owl at the Liberty Marsh in Wallkill River National Wildlife Refuge on Wednesday 1/14/15. I, of course, spent Thursday and Friday evenings after work going for the bird, but with no luck. I left the house this morning with the Snowy Owl being the most important bird on my mind. I did some running around in the Black Dirt and even followed a lead that took me to Chester, NY but had no luck with the Snowy. 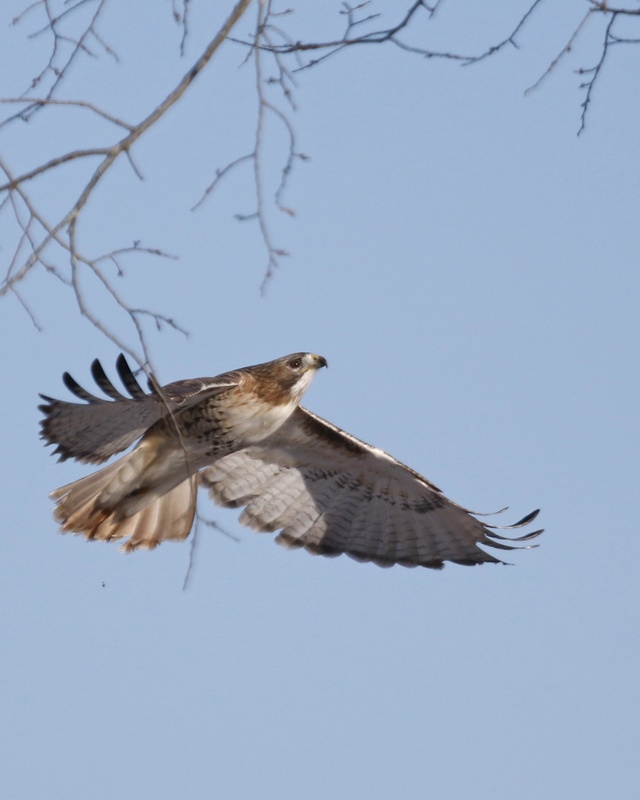 The Chester bird was likely a leucistic Red-tailed Hawk; I saw photos from the couple that had given me the lead, and I got a very distant look at the bird through my scope. I would like to get back there to get a better look one of these days. 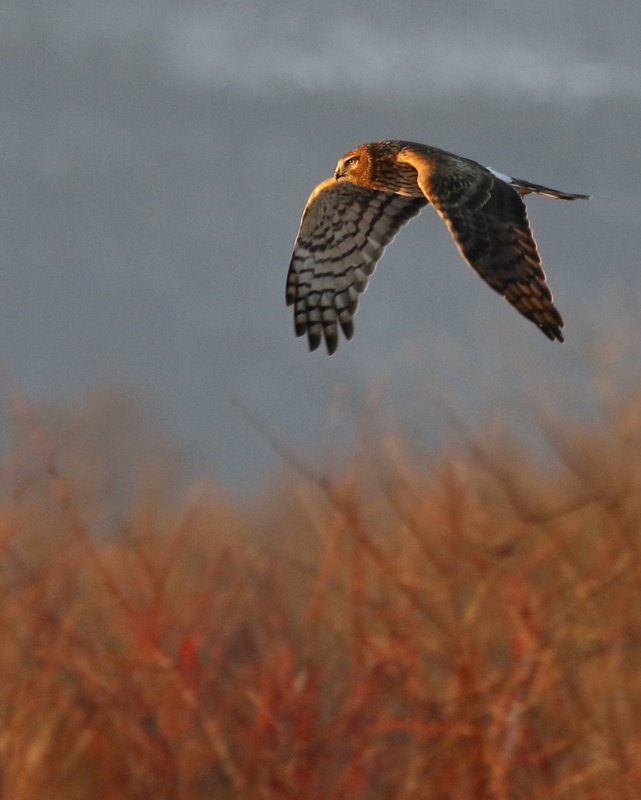 In the afternoon I decide to just try for some photos, so I headed to the Shawangunk Grasslands NWR. 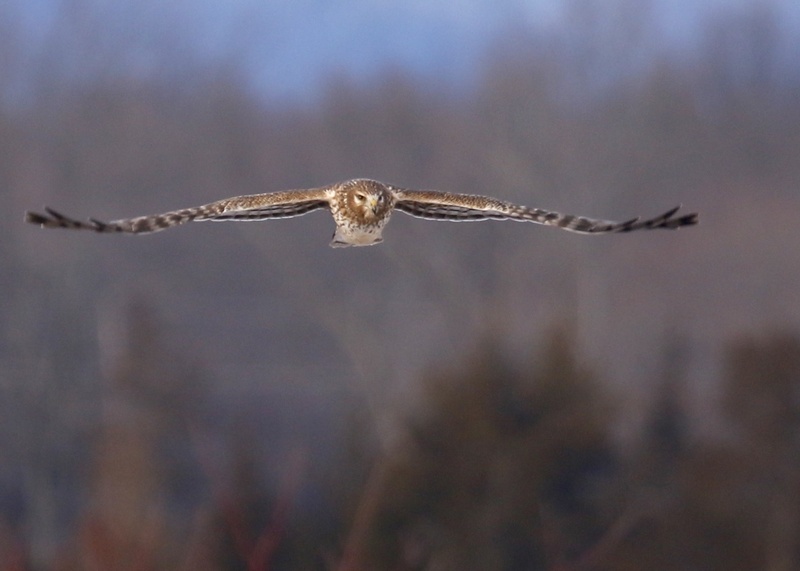 The north blind that is furthest out was free, so I spent the afternoon shooting raptors. I love spending time in the blinds out there; you can get such great looks at the birds. QUICK POST: I made the rounds in southern Orange County this afternoon but I didn’t find anything out of the ordinary to report. It was a cold and gray one, but I still did my best to get some photos; here are a couple of shots from the day.